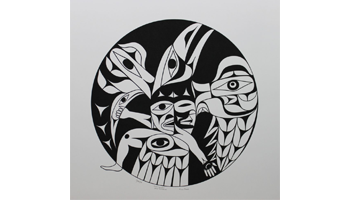 What’s perhaps most fascinating about Tim’s work is his extensive knowledge and understanding of Northwest Coast culture and history. His works go far beyond what the eye sees. There is a lot of purpose and meaning behind every detail. There is no doubt, Tim Paul is one of the greats. He is an artist, a teacher, an environmentalist, husband, father, grandfather, and a fascinating story teller. A soft-spoken man, Tim Paul is very passionate about his family, heritage, and the environment. This is evident in his latest print, Ticc-Yupii (Your Balance), his first serigraph in over 10 years. Ticc-Yupii is about the importance of having balance in our lives, and about being aware of the harm that we can do to those around us, and to the environment. Yet, there is hope. We can change, but we need to act. We need to take action. We need to take that important first step. We need to set the foot outside the circle and let the good come out to achieve balance.